Nani Kai Hale is centrally located on Sugar Beach, the longest stretch of white sandy beach on this side of the island. Next door is the Maui Canoe Club, where you can watch avid canoe paddlers launch off. Come witness a true Hawaiian art and tradition! 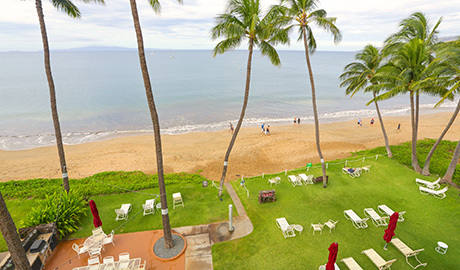 This oceanfront resort offers breathtaking views of the Pacific Ocean and the islands of Kaho’olawe and Molokini. The complex offers heated pool, beachfront grass lawn with lounge chairs and tables for dining, and BBQ Gas Grill. From here you’re just a six minute walk to the nearby general store, popular Ululani Shave Ice, Sugar Beach Bake Shop, and a farmers market on offering all fresh, tropical fruits you desire (Monday thru Friday 8am-4pm).